In order: out of Tor, R.S. Belcher’s The Six-Gun Tarot. Out of Victor Gollancz for review for Strange Horizons, C. Robert Cargill’s Dreams and Shadows. Out of Jo Fletcher Books, Ian McDonald’s Planesrunner (which I hope to review for summer Ideomancer.com). 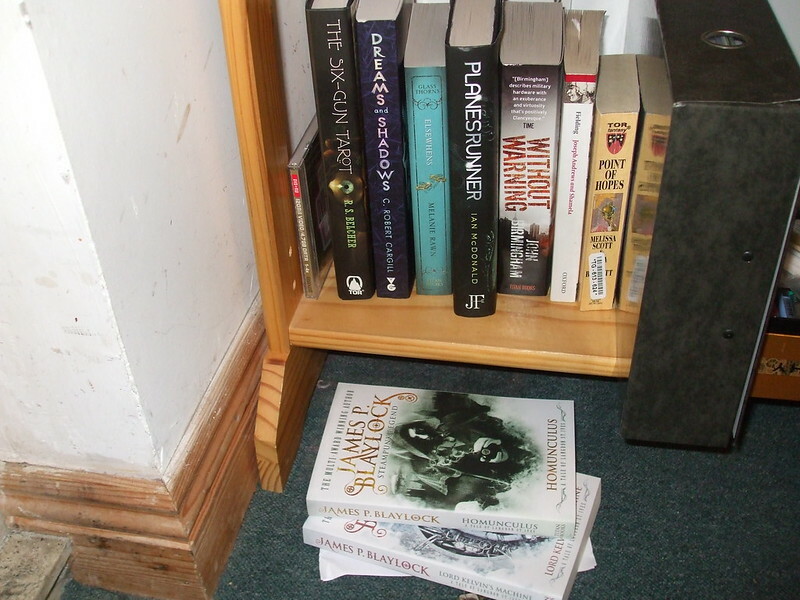 Out of Titan Books, Melanie Rawn’s Elsewhens (hope to treat of it in a column), John Birmingham’s Without Warning, and James P. Blaylock’s Homunculus and Lord Kelvin’s Machine. See, the problem for me with the last few named is the nice publicist at Titan emails and says, do you think you might be interested in reviewing these books?, and the problem is, I’m always interested. So I say Yes, I am! without really thinking about the fact that a)I review books for a limited number of venues (even if our reviews editor at Ideomancer.com seems to be pretty cool with whatever I send in – if I write two reviews a quarter, that’s still only eight books a year – and my only controlling principle for the Tor.com column is that I’m prioritising women’s and queer/queer-friendly writing/media) and b)I have a limited amount of time in which to read books. I don’t consider that I have an obligation, as such, to publicists for publishers, to read and talk about the books they might send. (They takes their chances.) But it’s not, I think, good, to be saying yes too often. I already have too many books on my TBR list, and craptonnes of (mostly reading and writing) work to do. Although, y’know, I’m not complaining about review copies. They’re pretty great. And I will read them. Just not necessarily swiftly. This entry was posted in SFF and tagged books, reviews. Bookmark the permalink.